Days are getting longer and temperatures are rising and we are suddenly seized by the urge to spend more time outdoors, but that doesn’t necessarily mean going anywhere. If we are fortunate enough to have outdoor areas at home, then it’s time to make the most of them and enhance their appeal. A house in the country with a large garden? Maybe a penthouse flat with a terrace? Or perhaps a private inner courtyard? Whatever the size and characteristics, here you will find some practical tips on how to make the most of your outdoor space. You’re in luck. If you chose a house with a large garden, then you are probably already picturing those delightfully relaxing moments spent outdoors and the wealth of possibilities. However, it should also be remembered that outdoor spaces like these also require maintenance, upkeep and lots of creativity. - Consider the maintenance. If you’d like to combine lawn and plants with some kind of paving, then ceramic tiles are your perfect ally. This material is easy to care for and also allows for nu-merous effects ranging from cement to wood. - And if I have a pool? In that case, you should consider a specific type of non-slip paving. Have you heard about raised access flooring? It guarantees better drainage. 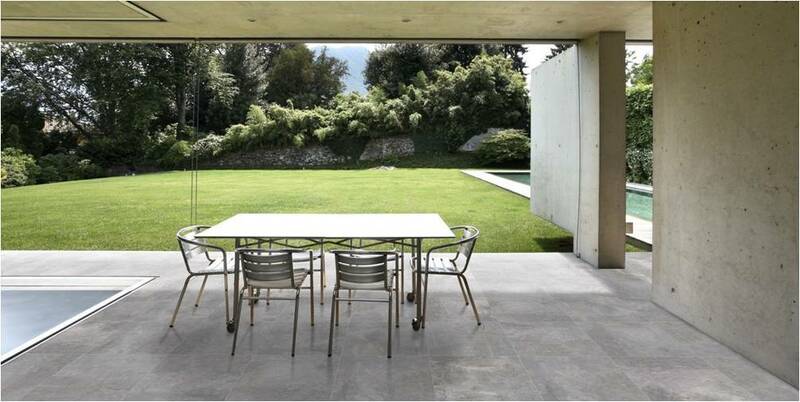 Keraben’s Nature and Stonetech collections feature 20 mm floor tiles. - Differentiated settings. You can include as many features as you wish, as long as they are divided into various settings. Create a chill out area furnished with comfortable sofas for relaxing; a play area for having fun with the kids; and add a gazebo for a very special outdoor dining area. - Long life to plants! What would a garden be without them? The weather is a prime factor here: make sure you choose hardy species that can withstand your local climate. You should also think about the maintenance and how much time you have to spend on it. And last but not least, the style: tropical, oriental, desert, etc. Whether it’s a penthouse with a view, or an inner courtyard leading from the interior, an outdoor space is an added value for any home. Indeed, it’s like having your own private oasis; a space for rest and relaxation where you can take a break from routine. Make sure you make the most of yours. - Decide what you intend to use it for. Terraces tend to be smaller than gardens, so in this case you’ll have to choose. Fit it out in accordance with your lifestyle. Maybe you want to use it as a space for relaxing with a good book, or for organising barbecues for friends. - Resistant, non-slip materials. Outdoor spaces require the right flooring that will prevent slipping in wet weather but that allow you to go barefoot on sunny days. Thanks to its Antislip Shoeless by Keraben technology, Keraben has come up with non-slip porcelain tiles with a textured surface that is imperceptible to the touch. - Choose the right furniture. On the one hand, the size has to adapt to the space available on the terrace, but the materials also have to withstand being outdoors. Go for wood, rattan and wicker. And who said that textiles such as cushions and throws were not an option? - Brighten up. Natural light is one of the most outstanding features of any terrace, but when night falls they are still great spaces for hanging out thanks to the clever use of lighting. Create cosy, intimate settings with spotlights, lanterns and lamps. You can also take advantage of the solar light bulbs that recharge during the day. And if all I’ve got is a balcony? Be creative! After all, that’s what interior design is all about: essentially, doing a lot with very little. - Focus on the flooring. As we’ve seen, there are non-slip surfaces that require little or no main-tenance and are easy to clean. What’s more, floor tiles create a strong visual impact, adding a sense of renewal however small the available space may be. - Use small items of furniture. A good option is to use items with a dual function, such as a stool with storage space. Alternatives include folding chairs and tables that you can store inside or in a corner of the balcony. - Walls are your allies. Remember to put the walls to good use, hanging plants or lamps. The idea is to put the available space to maximum use. -Create a sense of privacy. One of the advantages of small spaces is that they transmit a sense of cosiness, ideal for reading or sharing breakfast in. You can add to this intimate atmosphere by placing plants in strategic positions or installing wicker fencing. The good weather has arrived, and it’s time to smarten up our outdoor spaces. Getting outside to enjoy the sunshine is practically a must, and doing it in the comfort of our own home a luxury.